Ride the Astoria Riverfront Trolley to see city landmarks and learn about Astoria’s history from the Trolley’s conductors. Visitors can ride a three mile route along the Columbia Riverfront from Uniontown in the west to the foot of 39th Street. 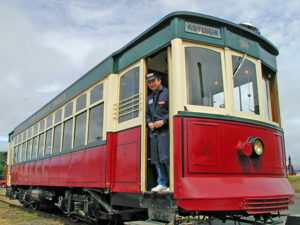 The fare to ride “Old 300,” the restored 1913 streetcar, is just $1. An all-day hop on/hop off fare is just $2 – one of the best bargains in Astoria. The Trolley’s nine convenient stops include the Maritime Memorial Park, Columbia River viewing platform, Columbia Maritime Museum, and The Uppertown Firefighters Museum. The historic Uniontown area includes over a hundred historically significant buildings typical of late 19th- and early 20th-century architectural styles, including Italianate, Queen Anne, Stick Style, and Craftsman. Ahead on the Trolley’s route is the famous Astoria-Megler Bridge, joining Oregon and Washington. Under the Bridge, Maritime Memorial Park honors members of the U.S. Coast Guard and local residents lost at sea, together with the region’s seafaring heritage. A small park and dock at the 6th Street stop offers a viewing platform where visitors can watch the ship traffic along the river. Another small riverfront park at 14th Street marks the historic landing for Car Ferry No. 2, the only way to reach the state of Washington until the Bridge replaced the ferry in 1966. Around 13th and 14th Streets, the Trolley passes through the part of the city destroyed in Astoria’s two great fires in 1883 and 1922. At 17th Street, the Trolley stops at the nationally-known Columbia River Maritime Museum; the Heritage Museum, with its regional historical exhibits, is nearby as well. Past the Mill Pond, the Trolley stops again at 30th Street. Nearby, the Uppertown Firefighters Museum exhibits antique firefighting equipment, including hand-pulled and horse-drawn vehicles, plus historic photos of the 1922 fire. 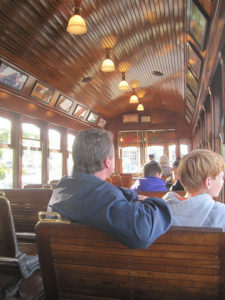 Visitors hear the clang, clang, clang of the Trolley throughout the late spring and summer months. It’s fun to just take the hour-long ride, but even better is to use it to see some of the many Astoria attractions along its riverside route. The Old 300 website includes detailed information about the landmarks along the route as well as the Trolley’s history and schedule. When you’re staying with us at Clementine’s Bed & Breakfast on Exchange Street, the closest Trolley stops are at the foot of 6th Street and 11th Street. Either stop is just a six or seven minute walk from the bed and breakfast. The Trolley has just begun its 2018 season, so it’s time to give us a call or go online and book your spring getaway now! NOTE: The Trolley does not run when it’s raining. This entry was posted on Tuesday, April 10th, 2018 at 3:24 pm and is filed under Attractions, Clementine's Bed & Breakfast News. You can follow any responses to this entry through the RSS 2.0 feed. Both comments and pings are currently closed.